In the IBM Boeblingen Laboratory some software was experimentally developed in the framework of a "traditional" life-cycle model where precise semantics were introduced very early in the development process through the use of a formal specification method. 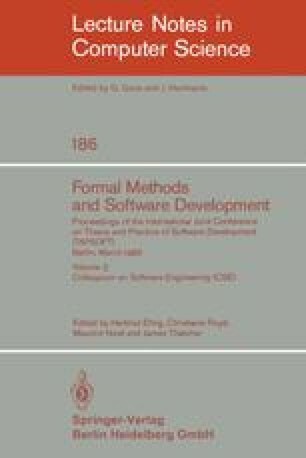 As a typical example for these ongoing efforts, the development of a medium-size software product is presented where a first informal global data flow specification was described using simple graphical conventions. The result of this development step was refined and formalized using the formal specification technique proposed in [JON80]. The specification and design language SLAN-4 [BEI83] was used to document this specification. The experiences are outlined which were gained by this development approach.